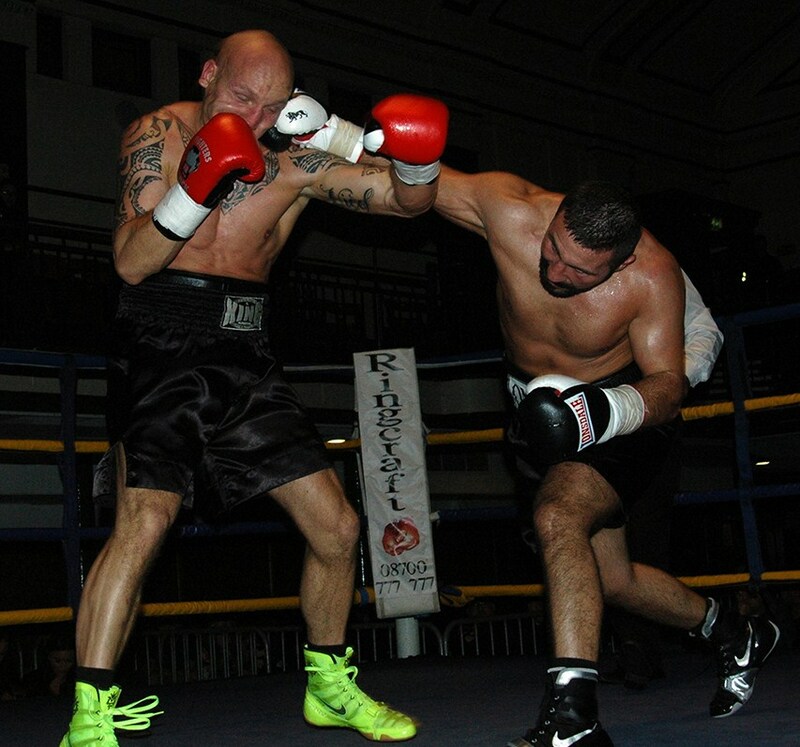 On Friday night boxing fans from around the country made their annual pilgrimage to the York Hall in London for the first event, the Shaym Batra promoted, WBU Championship headed, LEGENDS & PROSPECTS, in the Capital in 2015. There may have only been five fights, following the loss of both Australian Pierre Karam, who failed to obtain a visa in time to compete for the WBU International Heavyweight title, and the UK’s very own Steven Bendall, whose opponent fell through at the last minute, but the fans, including those that travelled all the way down from Birmingham, to support Antonio Counihan, and Bradford, to support Tasif Khan, must have felt it was well worth it, as it was a truly memorable night of boxing. Heading up the show was Nazeing, Essex’s George ‘Hit Hard’ Hillyard against a late replacement in the Czech Republic’s Michal Vosyka. From the off it was Vosyka taking control of the proceedings, the Czech fighter stylishly dominated the early part of the opening round, working off his mighty left hand jab to keep Hillyard at a safe distance. 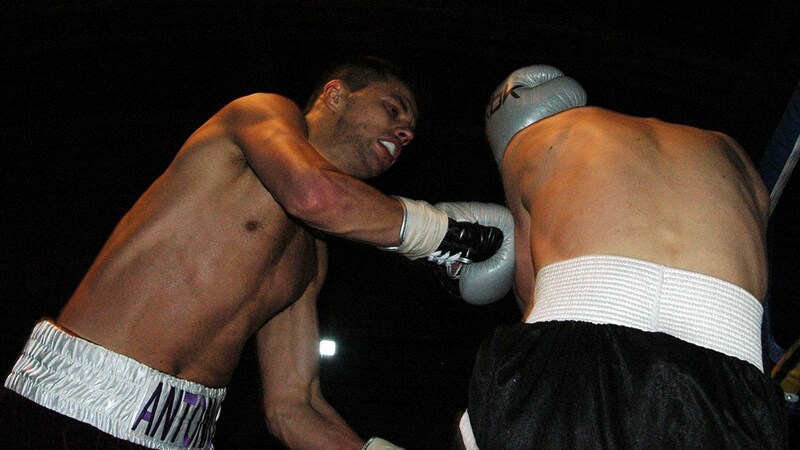 Hillyard, was more than content to bide his time as Vosyka moved around the ring flicking his jab at Hillyard as soon as he made any move to close the distance. Don’t get me wrong Hillyard did land some shots early on, but it wasn’t until around the second minute mark that the Essex lad managed to make any real impact but when he did it was with one of his trademark right hand exocets, a fantastic shot that virtually stooped the Czech in his tracks. In a flash Hillyard let rip at the disoriented Vosyka with a sensational double handed assault to send him down to the canvas. Vosyka boxed beautifully in the opening minute or so of the second stanza, albeit a little more cautiously, his constant strong jabs and double handed flurries left Hillyard no option but to play the waiting game once more, looking for an opening so that he could let a big right hand go. More of the same in the third, but as in the first Vosyka made the fatal error of giving Hillyard the opportunity to capitalize on an opening, Hillyard’s no slouch, he was in there like a flash, letting rip first with a big right and then a double handed barrage to send Vosyka to the canvas for the second time. Vosyka was much, much more cautious in the fourth, he was also more open than previously, which provided Hillyard even more opportunities to punish him big time. Hillyard backed Vosyka towards the corner before letting rip with powerful lefts and rights before letting rip with a lightning quick left to the body, Vosyka had no option but to take to one knee, in order to get his breath back. The moment referee Mickey Vann finished count, Hillyard literally shot across the ring and let rip with a massive right hand to the head, as Vosyka reeled back, off balance and heading back to the canvas, Hillyard let rip with a massive right to the head, sending Vosyka down and out fro the count. Referee Mickey Vann was down at the side of the prone Vosyka in a flash, as was the ringside doctor and paramedics as a hush fell over the hallowed York Hall. A minute or so later the silence was shattered as a round of applause from the crowd rang out, as Vosyka was helped to his feet. 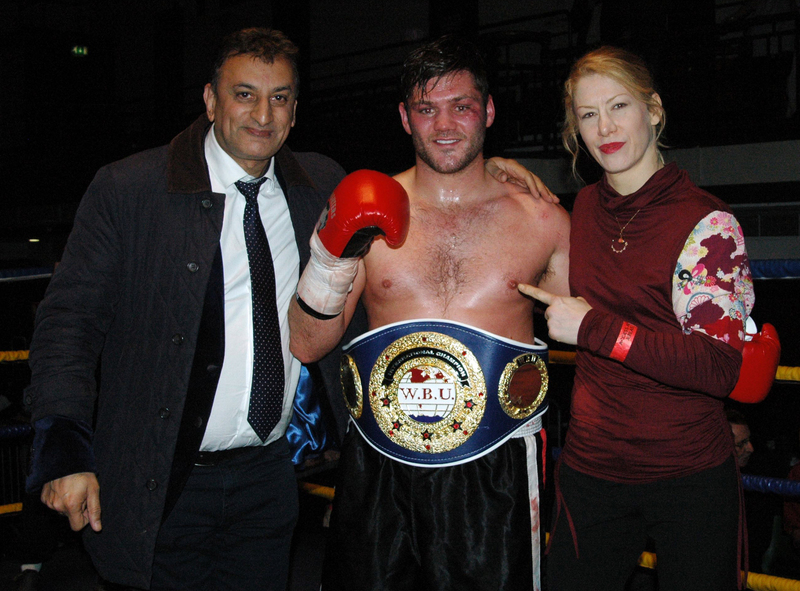 Once Vosyka was given the all clear by the ringside medical team, MC Steve Holdsworth made the official announcement, which was followed by the WBU International Championship belt being presented to a clearly elated Hillyard by WBU Ambassador Marianne Marston. Chief support see the stylish, unbeaten, Hackney based Turk Siar Ozgul step down a weight to Welter as well as undertake his first six rounder, against super tough competition in the form of Czech Republic’s Vladimir Fecko. Right from the off Ozgul secured control of centre ring, utilizing his seriously strong jab to great effect, Fecko though was intent on wrestling control from the young Turk, which lead to some fantastic toe to toe action. Both protagonists stepped up the pace in the second stanza, Ozgul really seemed to get into a flow, allowing himself to make some decent openings to test the mettle of the Czech lad, as he let rip with solid body shots. 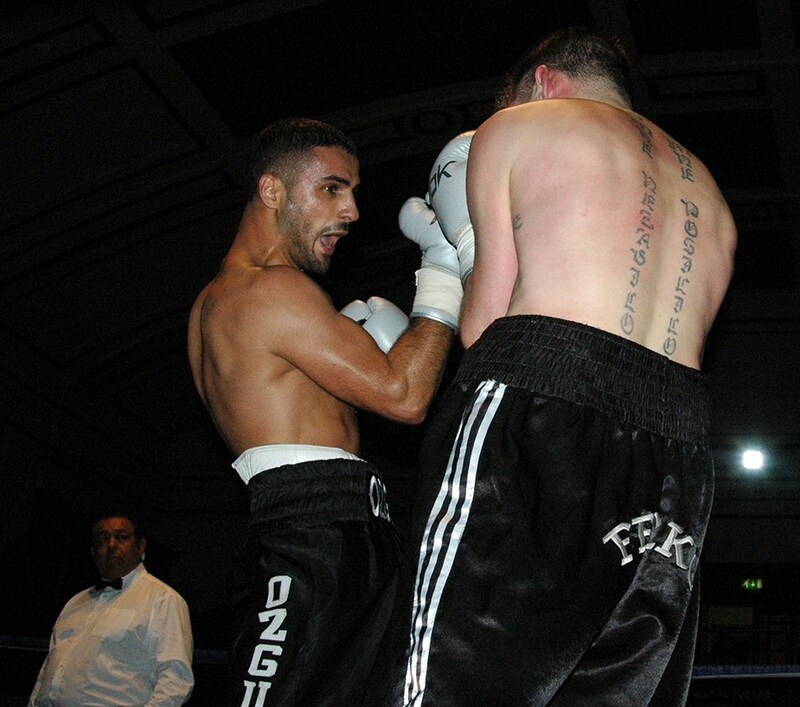 More of the same in the next couple of rounds, but by round five Ozgul, who was well ahead on referee Ken Curtis’ scorecard, really went for it, what a round, Ozgul showcased his immense skills in fine style, picking off Fecko at every opportunity, from an array of angles. Fecko, who was well aware to win he needed a knockout, came out hard and fast for the final round, Ozgul firmly stood his ground and what followed could only be described as a toe to toe battle royale ensued for virtually the whole round, much to the delight of the ~York Hall faithful. After six sensational rounds of boxing referee Ken Curtis’ scorecard read a shut out 60-54 points victory for the younger Ozgul brother – although have to say Fecko made this fight what it was, yes Ozgul out-boxed him to secure each round but Fecko deserves praise for his performance also. Prior to the third bout of the event MC Steve Holdsworth introduced a special guest to MC the bout, none other that sixties super star singer and actor Jess Conrad OBE, who then announced that it would be Siar Ozgul’s older sibling, Onder, that would be next in action, against Czech Republic’s Karel Horejsek, in a four round Light Heavyweight contest. Without doubt the fight of the night, younger sibling’s Siar fight was first class, but Onder’s was to another level altogether. It was an out and out war, it was all action from start to finish, with neither protagonist being willing to concede any ground whatsoever. For the full twelve minutes of ring time, these two just went hammer and tongs at each other and for large amount of the time they seemed tied to each other as they fought it out at close quarters. Praise has to be lavished on both Ozgul and Horejsek for such a magnificent display of the pugilistic arts, unfortunately there has to be a winner and a loser and it came as no surprise to anyone that Referee Ken Curtis scored each round in favour of Ozgul, as virtually every punch he threw not only landed but were by far the most meaningful, however as I said you can’t take anything away from the Czech lad as he made this fight what it was, he really came with one intention, to win, just this time he was against one of the toughest Light Heavyweights around, well the Turkish fans don’t call Onder ‘Little’ Mike (a comparison in style with ‘Iron’ Mike Tyson) for nothing. The second fight of the night see the return of Bradford’s Tasif Khan to the ring, following a two year sabbatical from the sport, where he faced Richard Voros, a highly experienced boxer and kick-boxer from Hungary, in a four round Super Bantamweight contest. Voros sprung from his corner as soon as the opening bell rang and went straight on the attack, forcing Khan to cover up, however it didn’t take the Khan too long to turn things around, with a good strong jab, before letting rip with a scintillating double handed flurry, which forced the Hungarian to cover up. With the bit between his teeth Khan took full advantage by letting rip with super fast combinations at will. The power and accuracy of Khan’s shots paid dividends almost immediately and on around the thirty second mark Voros was unceremoniously sent to the canvas for the first time with a massive right. Khan really started to get into a rhythm, so much so picking off Voros with powerful shots to body and head with impunity, albeit for only a short while as on just before the minute mark he let rip with another cracking right to send Voros to the canvas for a second time. Voros made it to his feet, only to be subjected to another huge barrage of punches, which forced Voros to cover up in a vain hope of making it to the end of the round, no chance, Khan just kept up the barrage until referee Ken Curtis had seen enough and stepped in to save the Hungarian from any further damage on the sixty fifth second mark. 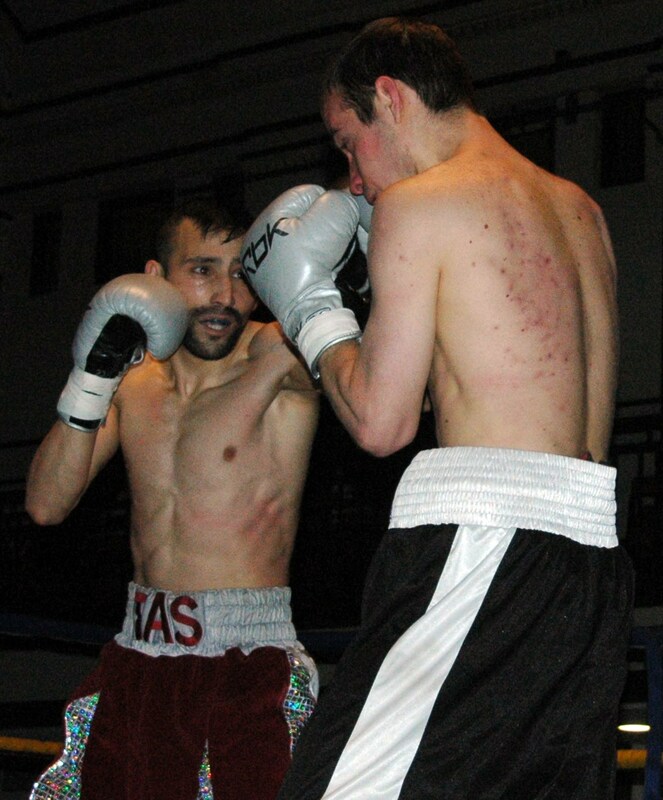 Counihan, who came into the fight with an unbeaten in four pro outings record, put in another World class performance, yes this kid is that good, out-boxing Kis, a twenty-five fight veteran, with ease from start to the early finish. 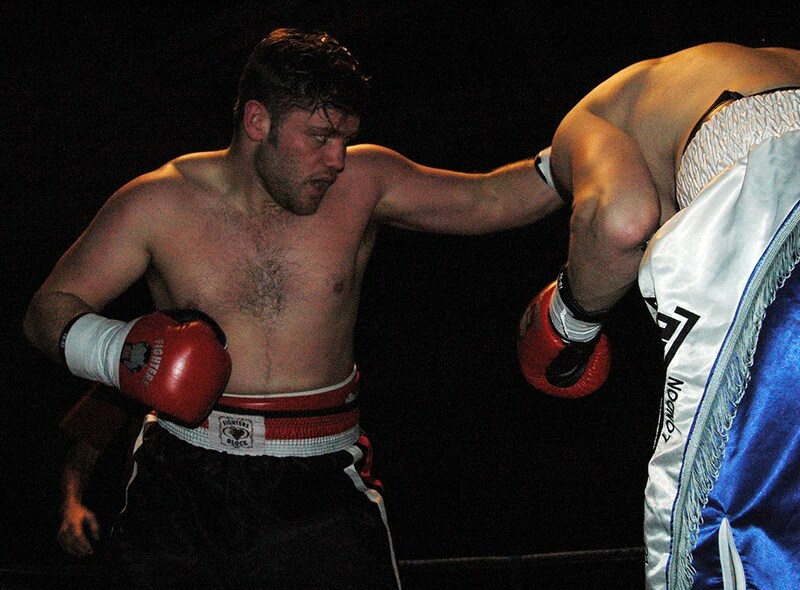 Counihan controlled the bout from the start, in doing so showcased the skills that not only earned him a place on the England amateur squad but also the accolade of becoming the England team captain. Rounds one and two were more like an exhibition by Counihan, seemingly picking off his more experienced opponent at ease, his punches were clinical and powerful to the extreme, so much so that Kis made a visit to the canvas in both the first and second round. By midway through the third Counihan stepped up the pace a little, in doing so put Kis way outside his comfort zone that the Hungarian had no option but to just cover up and hope that he could make it to the end of the round, unfortunately for him unsuccessfully, as on the two minute and fifteen second mark Counihan landed a peach of a right hand to send Kis to the deck for the third and final time. The Brummie youngster has really taken to the pro game in style, Kis is no walkover, by a longshot yet Counihan made it look far too easy and his record now stands at five bouts, five wins, four by stoppage finish. These were great performances, not just from the home fighters, praise must go to all the opponents too, more so to the likes of Karel Horejsek and Vladimir Fecko, who really did bring their A game, but each of the opponents came and did their best, just Counihan, Khan, the Ozgul brothers and Hillyard were just plain sensational on the night. If this is the standard of events we can expect in 2015, I for one can’t wait for the next – bring it on!